China’s State Council will soon issue a draft of the country’s first E‐Commerce Law for public comment. Provisions of this proposed law may offer new tools for protecting trademarks and other IP rights online. Meanwhile, there are indications that Alibaba – which dominates China’s domestic e-commerce with more than 80% of the market – will soon introduce a range of new reforms to support cooperation with trademark owners in addressing online infringements. Details of Alibaba’s initiatives and the draft E-Commerce Law remain undisclosed at present. But both are expected to address public concerns over the continuing high levels of fake and shoddy goods offered through online marketplaces. The precise scope of such counterfeiting remains unclear. Nevertheless, recent surveys by the China Consumer Association and the State Administration for Industry and Commerce suggest that over 37% of goods sold online in China may be fake. The impending E-Commerce Law and Alibaba initiatives are unlikely to end all online counterfeiting soon. Brand owners should therefore consider a range of best practices as they establish and tweak their online enforcement programs. Over the past few years, Chinese e-commerce platforms, including Alibaba, have increased the use of filters and other measures to prevent the appearance of ads for fakes. They have also devoted greater resources to investigation and enforcement, including referrals of suspected criminal cases to Chinese police. To maximize access to these benefits, brand owners should provide accurate and detailed data of potential infringements, and quickly follow up on any requests for further assistance from platforms or authorities. IP owners should also take the initiative to offer detailed survey data and other relevant information to illustrate the limited impact of standard take-down remedies for fakes of their products. The more detailed the data, the greater the chance of obtaining more tailored and effective support. Approaching trade platforms directly, rather than only through service providers, can also improve the level of attention and support that brands get. sellers that offer multiple brands of fakes. Increasingly, monitoring and enforcement work must be extended to new forms of social media. In China, the main outlets for monitoring will typically include the Weixin (WeChat) online messenger app and the Weibo microblogging platform. Pirates are increasingly using these media to distribute ads for fakes, with payments easily deposited directly to the pirate account through online payment services such as Alipay. More and more experienced counterfeiters are taking steps to reducing the risk of being detected by refraining from using language, images or pricing that provide a clear basis for requesting take-downs. Sophisticated infringers also often use this strategy to mislead consumers into believing their goods are genuine/parallel products. The ambiguity discourages many brand owners from requesting take-downs, fearing counter-notices from the sellers demonstrating that the goods offered are genuine – and fearing this would undermine cooperation with trade platforms’ enforcement teams and consume resources. Although this trend is on the rise, brand owners and their service providers can hone in on infringers by looking for less obvious indicators and conducting random purchases from vendors sharing particular characteristics (same location, similar product images, promotional language, etc.). Consideration can also be given to presenting the available data to trade platforms and asking them to revert to vendors for evidence their goods are genuine. Counterfeiters will often file counter-notices to challenge take-down requests and strap brand owners with unforeseen costs and hassle, even if the goods are fake. If the goods are obviously fake, such counter-notices can easily be ignored. However, when the counter-notices raise substantial issues, it is advisable to provide the trade platform with a quick, thorough explanation of why the goods are fake. If the goods cannot be proven to be fake, the vendor should be quickly investigated, for example by purchasing samples from it, or trying to get the vendor to admit via email or social media that they offer fake goods. Where there is no evidence that the goods are fake, it is sometimes best to quickly withdraw the complaints. Doing so may help to ensure that relations with the trade platform’s enforcement teams remain positive. Meanwhile, if there are doubts that the vendor is indeed dealing in fakes, they should be closely monitored in the future, with consideration also given to making test purchases to verify their goods. 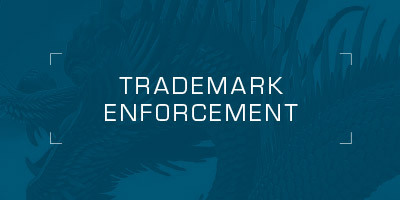 Trademark owners should ensure that their teams responsible for supervising online and bricks and mortar enforcement programs coordinate their efforts, mainly to ensure that intelligence on counterfeiters is shared and that enforcement actions by one team do not interfere with investigations by the other. For many industries, producers/traders of online fakes are based in a particular city. For example, IT counterfeiters are generally based in or near Shenzhen. Fashion industry fakes are often based in Guangzhou, Hangzhou or Yiwu. Consideration should therefore be given to focusing additional resources in key cities to generate leads, conduct investigations and liaise with local authorities. Sharing data on infringers with other brands that are victims can help to more quickly identify repeat offenders. Armed with such data and complaints from multiple brands, trade platforms are more likely to terminate the trading accounts of infringing vendors. Victim brands can generate significant return-on-investment by sharing costs of monitoring/investigating larger online infringers. Filing complaints in tandem can also maximise the chances of success in persuading police to pursue criminal investigations. Monitoring, investigating and enforcing trademark rights against online traders poses enormous challenges that should not be under-estimated. IP owners facing significant levels of infringement should not hesitate to invest significantly more in manpower and funding of countermeasures. It is also highly advisable to keep current on new technologies, tactics and service providers, and to routinely exchange know-how in this regard with other rights holders. Where the stakes are high, companies should also seek external service providers that bring “big data” solutions to the table. Meanwhile, rights holders, large and small, should identify brand protection firms that can quickly and cost-effectively conduct investigations into online counterfeiting rings.